Is Your Garage Door Old and Outdated? We can install a brand new garage door opener for you quickly, and for a fair price. Looking to replace your aging garage door opener with a new model? 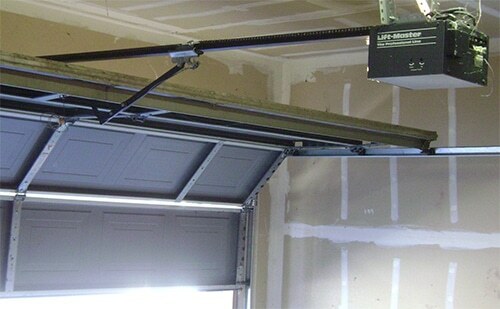 Tired of trekking through snow and freezing temperatures to open and close your garage door? Need an expert who specializes in garage door opener repair and maintenance? Here at Black Hawk Lock and Key, we offer fast, professional garage door opener installation and repair services that make it easy for you to enjoy the convenience of having an automatic door opener in your garage. A new garage door opener can make life easier – but only if it’s installed correctly. Installing a remote-controlled opener for your garage door involves a number of steps, specialized tools, and meticulous attention to detail. You’ll also need an electrical plug installed on the ceiling close to where your opener will be mounted to supply power to the motor inside the unit. Support rails need to be cut, measured and mounted to a solid surface – this often involves adding blocking to the framework inside the garage ceiling to support the weight and tension of the opener. Once the rail is connected to the motor unit, the pulley needs to be installed, attached to the door, and adjusted to the correct tension before bolting the bracket assembly to the door. A safety rope also needs to be connected to make sure the garage door can be opened manually during a power failure, and safety sensors need to be installed and calibrated. The garage door opener then has to be fully tested and linked with the remote openers and in-car transponders. At Black Hawk Lock and Key, we know you count on your garage door opener to work every single day – that’s why we offer fast mobile garage door opener repair services throughout Rochester and Pittsford. Our team of licensed, insured, and registered locksmiths have the experience it takes to quickly diagnose any problem with your opener, provide you with a clear quote, and perform the necessary repairs. We can also perform repairs on your garage door remote controls and wireless keypads, program extra remotes, and link your garage door opener with your vehicles. Your garage door is the largest point of entry into your home, and it’s also often the preferred point of entry for criminals. We can help to improve the security of your home and reduce the risk of break-ins through your garage by ensuring that your garage door opener is well-maintained and correctly set up. Because garage door openers are designed to automatically open if they hit any resistance while closing, it’s important to keep your opener running smoothly. For fast, professional garage door installation and garage door opener repair service, call us here at Black Hawk Lock and Key today.